Engineered Cementitious Composites (ECCs) are novel cement-based ultraductile materials which is crack resistant and undergoes strain hardening when loaded in tension. In particular, the material is piezoresistive with changes in electrical resistance correlated with mechanical strain. The unique electrical properties of ECC render them a smart material capable of measuring strain and the evolution of structural damage. In this study, the conductivity of the material prior to loading was quantified. The piezoresistive property of ECC structural specimens are exploited to directly measure levels of cracking pattern and tensile strain. Changes in ECC electrical resistance are measured using a four-probe direct-current (DC) resistance test as specimens are monotonically loaded in tension. The change in piezoresistivity correlates the cracking and strain in the ECC matrix and results in a nonlinear change in the material conductivity. Engineered Cementitious Composite (ECC) is an ultraductile fiber reinforced cement based composite which has metal-like features when loaded in tension and exhibits tough, strain hardening behavior in spite of low fiber volume fraction. The uniaxial stress-strain curve shows a yield point followed by strain-hardening up to several percent of strain, resulting in a material ductility of at least two orders of magnitude higher than normal concrete or standard fiber reinforced concrete . ECC provides crack width to below 100  m even when deformed to several percent tensile strain (Figure 1). Fiber breakage is prevented and pullout from the matrix is enabled instead, leading to tensile strain capacity in excess of 6% for PVA-ECC containing 2% by volume Poly Vinyl Alcohol (PVA) fiber which is a unique implementation by Yu and Dai . Typical stress-strain-crack width relationship and saturated crack pattern of PVA-ECC. Cracking in cementitious composite can result from a variety of factors including externally applied loads, shrinkage, and poor construction methods. Identification of cracks can be used to evaluate the long-term sustainability of structural elements made of cementitious composite. For example, small cracks affecting only the external aesthetic of the structure should be differentiated from those that reduce its strength, stiffness, and long term durability. Priorities should be given to cracks that are deemed critical to the structure's functionality (e.g. safety, stability). After suspicious cracks are encountered, nondestructive (e.g., ultrasonic inspection) and partially destructive (e.g., core holes) testing can be performed by trained inspectors to determine crack features (e.g., location and severity) below the structural surface. Perhaps the best approach for automated structural health monitoring of concrete structures entails the adoption of the sensors available in the nondestructive testing (NDT) field. In particular, passive and active stress wave approaches have been proposed for NDT evaluation of concrete structures. Acoustic emission (AE) sensing is foremost amongst the passive stress wave methods. AE employs piezoelectric elements to capture the stress waves generated by cracks ; while AE has played a critical role in the laboratory, its success in the field has been limited to only a handful of applications . In contrast, active stress wave methods have been proven more accurate for crack detection in the field. This approach entails the use of a piezoelectric transducer to introduce a pulsed ultrasonic stress wave into a concrete element and use the same transducer or another to measure the pulse after it has propagated through the element. A direct extension of the active stress wave approach is the electromechanical impedance spectra method. 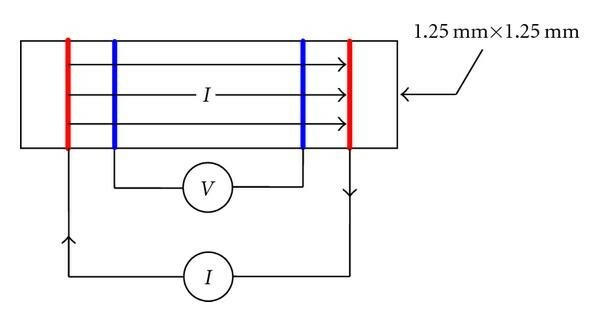 This approach measures the electromechanical impedance spectrum of a piezoelectric transducer to detect cracking in the vicinity of the surface mounted transducer . With digital photography rapidly maturing, many researchers have also adopted the use of charge-coupled device (CCD) cameras to take photographic images of concrete structural elements; subsequent application of digital image processing techniques automates the identification of crack locations and widths . Compared to other NDT methods, utilization of the electrical properties of cement-based materials for crack detection has gained less attention from the civil engineering community. In fact, the unique electrical properties of cementitious composites render them a smart material capable of measuring strain and the evolution of structural damage . 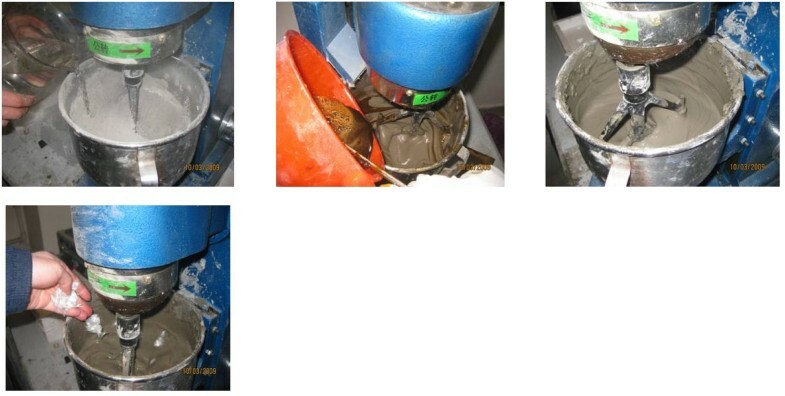 The measurement of electrical properties of cementitious composite is proved capable of detecting serious as well as minor cracks. In particular, ECC is piezoresistive with changes in electrical resistance correlated with mechanical strain. When ECC materials are mechanically strained, they experience multiple saturated cracking and change in their electrical resistance. In this paper, the piezoresistive property of cementitious materials is proposed as a novel approach for sensing strain and cracking in PVA ECC by utilization of their electrical resistance. The exploration of ECC materials piezoresistivity sets a scientific foundation for the use of the material as a self-sensing material for structural health monitoring in the future. In this research, the PVA-ECC mixture consists of cement, sand, fly ash, fiber, and superplasticizer, and the proportion is given in Table 1. Proportioning of each component with the correct mechanical and geometric properties is necessary to attain the unique ductile behaviour. Material Mixing proportion of PVA-ECC. High modulus polyvinyl alcohol fiber (12 mm Kuralon-II REC-15 fibers supplied by Kuraray Company) was used as the reinforcing fiber. Ordinary Portland type I cement, Class F normal fly ash and silica sand were used as the major ingredients of the matrix. Silica sand with 110  m average grain size was used as the fine aggregates. Melamine formaldehyde sulfate was applied as superplasticizer (SP) to control the rheological properties of fresh matrix. SP neutralizes different surface charges of cement particles and thus disperses the aggregates formed by electrostatic attraction. However, it has been reported that SP fail to preserve the initial flowability with time due to the high ionic strength in dispersing medium . Appropriate weight and adding sequence of the constituent must be determined because very little difference results in considerable change of the property of acquired PVA ECC mixture. Coarse aggregates are not used as they tend to increase fracture toughness which adversely affects the unique ductile behaviour of the composite. In addition, no coarse aggregates are present thereby rendering the material as electrically homogeneous. The sand and cement are mixed dryly first approximately for 30–60 seconds until the mixture becomes homogeneous (Figure 2(a)). Then water, fly ash, and SP are added orderly (Figure 2(b)). SP is used only when the mixer cannot mix further (Figure 2(c)). At the end the fibers are added but the mixture can be mixed for only 30 s, otherwise it will be very clumpy. The wet ECC mixture is placed in molds that cast ECC plate specimens. After 7 days, the specimens are removed from their molds to continue curing until mechanical testing occurs after the 28th day. In this section, ECC test specimens roughly cm in size are cast for electrical resistivity measurement of ECC. The measured resistivity of ECC test specimens is investigated using four-point probe methods with direct current (DC). As the name suggests, the four-point probe method employs four independent electrodes along the length of a specimen. Before the piezoresistivity of ECC can be characterized, the conductivity of the material prior to loading should be quantified. Time dependency is a direct result of the measurement technique and the dielectric properties of the material itself. Under an applied steady (static) electric field, The change in electrical conductivity is often viewed as an intrinsic feature of the material and has been used to understand the materials' chemical, rheological, and mechanical properties. After 1 day of curing, electrodes made of copper tape are applied to the specimen surface using silver paste; the electrical tape is applied around all four sides of the specimen, roughly 4 cm apart, as shown in Figure 3. The two outermost electrodes are used to drive an electric direct current I(DC) into the medium while the two inner electrodes are responsible for measuring the electrical potential and the corresponding drop in voltage V developed over the length L. Electrodes must be in intimate contact with the cement-based specimen to induce an ionic current within the specimen. Metallic electrodes can be surface mounted using conductive gels and pastes. Electrode instrumentation for the 4-point probe method of resistivity measurement. Current is applied to the specimen using a DC current source (Keithley 6221) while voltage measurements are made using a digital multimeter (Agilent 34401A). The resistivity of ECC specimens at multiple degrees of hydration, namely, at 1, 7, 14, 21, 28, and 35 days after casting was monitored by 4-point probe resistivity measurement. The magnitude of direct current (DC) used during 4-point probing is varied from 500 nA to 5  A. Figure 4 shows the resistivity measurement of ECC specimens over the first 600 seconds of data collection. For the specimens tested on the first day, the initial resistivity is about 158 kOhm-cm and grows to around 200 kOhm-cm after 600 seconds of DC charging. 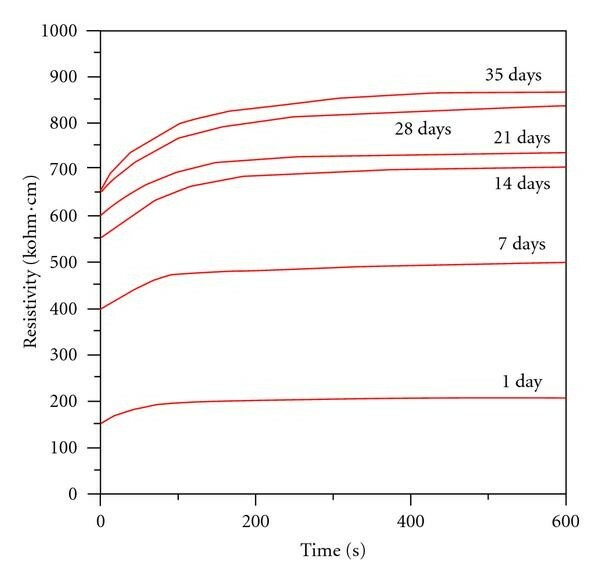 The initial resistivity of the specimens at 14 days is about 524 kOhm-cm and exponentially increases to about 720 kOhm-cm after 600 seconds of DC measurement. For specimens tested 35 days after casting, the initial resistivity is 652 kOhm-cm and increases to about 880 kOhm-cm after 600 seconds of polarization. It should be noted that initial resistivity reported in this study are under the case of 100% relative humidity (RH) curing environments. For cementitious materials that are naturally cured in air and not in a 100% RH environment, the initial resistivity and polarization may vary due to the variations in moisture contents that may occur over the test time period. Resistivity measurement of ECC specimens by 4-point probing. The higher initial resistivity encountered as the specimens cure can be easily explained. Since more and more ions are trapped by the hardening hydration byproducts, it is harder to mobilize the ions, which is consistent with a higher resistivity. The electric properties of the cementitious material are characterized chiefly by their initial resistivity at early stage. ECC is piezoresistive with its resistivity changing in relation to strain. To investigate the piezoresistive properties of the ECC material, ECC plates are constructed for axial loading. The dimensions of each plate are cm as shown in Figure 5(a). 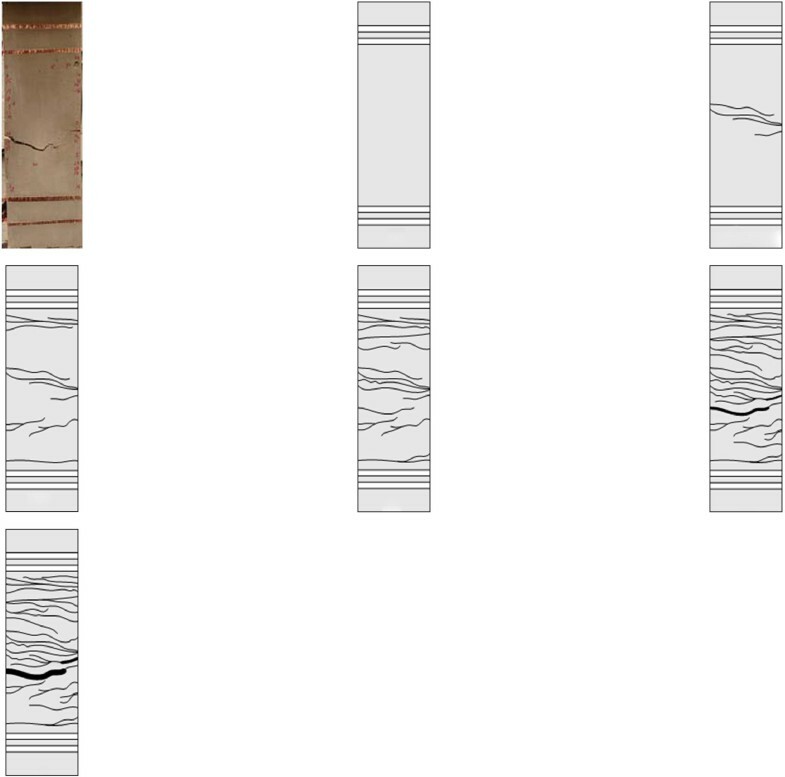 Prior to axial loading, copper tape is wrapped around the specimen at the four locations shown in Figure 5(b). These four copper tape pieces serve as the current and voltage electrodes for the 4 probe resistivity measurement. When ready for testing, the specimens are clamped in a MTS load frame for application of uniaxial loading. ECC specimens are loaded with very low loading rates ranging from 0.013 to 0.064 mm/second. The stroke of the load frame is recorded so that strain measurements can be made since access. Figure 6 shows the piecewise piezoresistive behavior of ECC specimen. Distinct regions where the resistivity-strain plot is linear are denoted by dots A through G. Each linear segment is due to a given crack state. The associated gage factors (the percent change in resistivity divided by strain) for each segment of the piecewise linear resistivity-strain curve are summarized in Table 2. As can be observed, the gage factors of ECC are generally lower and consistent at about 6.5 during the elastic regime (A-B). This elastic gage factor is about half the value of the ones encountered in the strain-hardening range. It should be noted that these gage factors are well above those associated with traditional metal foil strain gages which typically have gage factors of 2 to 3 proposed by Perry and Lissner . Gage factors of ECC based on 4-point DC probe measurement. Figure 7(c) through 7(g) show the cracking pattern of ECC specimen at loading point B through G, respectively. By observing Figure 7(c), it is evident that prior to the first cracking, changes of resistivity are mainly due to the elastic deformation of the ECC specimen. During the strain-hardening stage, resistivity changes are caused by the development of new microcracks as well as the opening of existing cracks along the ECC specimen. Once damage localization occurs (at point F), resistivity changes are then induced by the growth (i.e. widening) of the localized crack. The dependency of the gage factor on damage state could be potentially used to approximately estimate component health based on electrical resistivity measurement if strain is known. (a) Photo of the specimen after crack localization (at point G); (b)–(g), Cracking patterns at loading point B through G, respectively. This study exploits the piezoresistive properties of engineered cementitious composites (ECCs) so that they can be used as their own sensors to quantify the resistivity-strain relationship. ECC plate specimens were monotonically loaded in axial tension to induce strain hardening behavior in the material. As a result of linear changes in electrical resistance due to tension strain, ECC specimens could potentially self-measure their strain in the field. The resistivity of ECC specimens at different times after casting was monitored by 4-point probe resistivity measurement. The initial resistivity changes with hydration degree and increases with DC polarization. An interesting feature of the material lies in the detectable change in resistance-strain sensitivity when strain hardening initiates. The change in piezoresistivity correlates the cracking in the ECC matrix and results in a nonlinear change in the material conductivity. Additional work is underway exploring the theoretical foundation for ECC piezoresistive behavior. Financial supports from Laboratory of Novel Building Materials Manufacturing and Inspection in Shenyang Jianzhu Universiry are gratefully acknowledged. The authors would like to express their gratitude to Professor V. C. Li and J. P. Lynch, University of Michigan, for their helpful discussion on properties of ECC.